Brand India has lost its luster at Davos in 2011! Poor governance and corruption are endemic in India, and have been the talk of the town at Davos this year, tarnishing the meticulously crafted image of "Shining India" at the World Economic Forum since 2006. The immediate effect is that that India's foreign direct investment (FDI) is already down by a whopping 36% in 2010 from 2009, and there is no recovery in sight yet. Meanwhile India's current account deficit is exploding, accounting for about 3.5% of GDP. 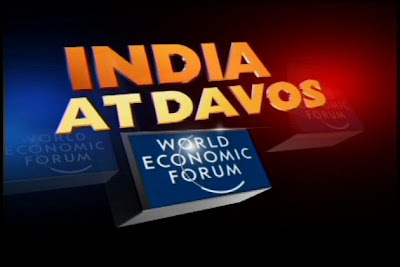 In 2006, the "India Everywhere" campaign orchestrated by Indian planning commission officials and the Confederation of Indian Industry (CII) dominated the ambiance of the World Economic Forum at Davos, Switzerland. They spent two years and more than $4 million and put together an elaborate marketing and PR campaign to ensure that the "India story" got prominent play and did not get drowned in the noise at Davos. The success of the initiative was apparent by the dramatic increase in FDI inflow to India which doubled from less than 1% of GDP to nearly 2% of the expanded GDP in 2008. For once, India is really everywhere at Davos. With the 35th World Economic Forum (WEF) opening at the Swiss mountain resort, one cannot help but notice India Everywhere. Right from the moment you step off the aircraft at Zurich airport, big hoardings proclaiming India greet you. Upon reaching Davos, located about 150 km from Zurich, the Indian colours are just about everywhere. In fact, you see more of India than Switzerland in Davos this year. The buses wear Indian colours, the bus shelters have Indian advertisements, and key bars, pubs and hotels in the city where the economic meet began Wednesday evening are serving up Indian snacks and Indian wines and beer. Reports from the World Economic Forum at Davos in 2011 offer a very different narrative. Coming after the massive multi-billion dollar telecom corruption scandal in 2010 and expression of deep concern by some prominient India businessmen about the nation's governance deficit in 2011, India's presence at the World Economic Forum 2011 was decidedly lower key when compared with the heady days of 2006. Summing up the sentiment at Davos, an Indian journalist opined as follows: "..such a forthright disregard for the so-called "India story" may understandably offend nationalist sentiments and bring on the "west versus rest" polarization that keeps many public intellectuals in business. But the harsh truth is that India has been sold, resold and re-re-sold in so many samosa and Sula evenings that it has lost novelty." Davos 2011 was a crisis sumit!In case you didn't notice. Not ONE single country was feted at the summit. 2.India is already perceived as a major player and a future power by the people that matter. ... the ‘event managers’ of the India show were late by three years as nobody in the famous Alpine ski resort today has the patience to hear the old “India Story” that drew applause till 2008 — to the strains of Bollywood music in Zurich — and the line “India Everywhere.” In retrospect, the Indian extravaganza at Davos seems as pretentious as the throng of Kolkata’s dubious book lovers. By 2009, attendance began falling in India-related events at Davos. In that year not even 20 guests attended an Indian IT czar’s evening session. India in 2011 is a disaster story, with Foreign Direct Investment (FDI) contracting by a stunning 31 per cent in a single year — from $34.6 billion in 2009 to $23.7 billion. On the other hand, FDI to Singapore, a country one-fifth the size of the National Capital Region of Delhi, has grown by 122 per cent in 2010—an astounding $37 billion. What is rising is the flight of Indian-owned capital from India: estimated an astonishing $75 billion in the first decade of the millennium, according to a Columbia University study. Against this backdrop, the question that needs to be asked is: Why must the government spend millions of tax rupees to fly its flag at the Alpine jamboree? What object do the evening parties at Davos serve, attended by the same people who usually meet in Mumbai and Delhi for the same purpose — whining and dining. When put in the China-context, the India story looks even grimmer. The dragon slalomed past the tiger in Davos 2011. China did not have to announce its presence from a restaurant corner, offering samosas as fondue; its aura was felt everywhere. The China-focused sessions spoke more about what China could do for the world than about itself, or its potential. There was no China hoarding visible anywhere. Their delegates numbered just over 20. But hardly a session went without a Chinese face on the podium, or a deferential mention of the country in the proceedings. It was ironic when Min Zhu, a Chinese special adviser to the IMF, not only stole the show in a discussion on India — addressed among others by Chidambaram and ICICI Bank chief Kochhar — but also advised Indians quite magisterially on how serious they ought to get on the inflation problem. Rahul: "Why do you compare with China. Compare with your own country. What were the comments on Pakistan in Davos. Can you enumerate.... "
Unlike India with its expensive "India Everywhere" and "India Shining" campaigns, Pakistanis have never paid much attention to World Economic Forum. Nor has China. While India sends hundreds of people to court attendees at WEF, China sends only about a dozen, and Pakistan sends even fewer. AFAIK, the only Pakistanis who attended WEF at Davos this year are Imran Khan, the cricketer turned politician-philanthropist and Saadia Zahidi, a Pakistani economist. Rahul: "As for China's presence you might have missed the news." "When put in the China-context, the India story looks even grimmer. The dragon slalomed past the tiger in Davos 2011. China did not have to announce its presence from a restaurant corner, offering samosas as fondue; its aura was felt everywhere. The China-focused sessions spoke more about what China could do for the world than about itself, or its potential. There was no China hoarding visible anywhere. Their delegates numbered just over 20. But hardly a session went without a Chinese face on the podium, or a deferential mention of the country in the proceedings. It was ironic when Min Zhu, a Chinese special adviser to the IMF, not only stole the show in a discussion on India — addressed among others by Chidambaram and ICICI Bank chief Kochhar — but also advised Indians quite magisterially on how serious they ought to get on the inflation problem." Rahul: "If Pakistan is not sending its delegates to WEF then its doing a pretty big mistake." This is a good post because now truth is coming out for India. All the media people make Pakistan look bad and they don't know India is more corrupt and democracy is fraud. one day everyone will know the truth about India becuase it is the main sponsor of troble in Pakistan and also the world. Riazbhai i also called Templeton about Karachi stock but they charge 5% and no garantee. They can also use my money to invest in India which i dont like. Maybe it is secret. Please tell me how you made so much money in Karachi stock. I cant find info in newspaper or internet. Maybe all the Indian media dont want money going to Pakistan because then more money will go to India! Please put info on your webpage about Karachi stock. Thank you very much. Cherry picking news articles seems to make you happy. Actually its getting a bit boring.Davos or no Davos PAkistan is currently in a lost decade with NEGATIVE percapita income growth since 2008. India is now the world's 10th largest economy (nominal) and will be 3rd or 4th largest by 2020. Unfortunately there is pecious little your blogging can do to these facts on the ground. Incidentally Riaz our merchandize exports will increase 35% this year even though FDI has fallen which means that our domestic industry like Japan/South Korea DOES NOT NEED FDI to export. We CONCIOUSLY protect our domestic industry by LIMITING FDI which is why we have TATA ,Larsen and Toubro,MAhindra,CG,Thermax etc etc and you don't. Anon: "We CONCIOUSLY protect our domestic industry by LIMITING FDI which is why we have TATA ,Larsen and Toubro,MAhindra,CG,Thermax etc etc and you don't." Unlike China or Pakistan, India's economy depends heavily on FDI and FII to fund its growing trade deficit and overall current account deficit. India's current account deficit is being increasingly funded by short-term capital inflows (FII) rather than more durable foreign direct investment (FDI), posing a risk to external balance and funding of gap, according to a recent warning by Goldman Sachs. "Nearly 80 per cent of the capital inflows are non- FDI related. Given the excess spare capacity globally, FDI may remain weak going forward," the Goldman note said. SK: "Please tell me how you made so much money in Karachi stock. I cant find info in newspaper or internet. Maybe all the Indian media dont want money going to Pakistan because then more money will go to India! Please put info on your webpage about Karachi stock." First, let me dispel the notion that I have made a lot of money in stocks in Karachi or anywhere else. Second, I don't think there are any pure-play mutual funds or ETFs for Pakistan yet, but I have heard of plans for launch of such products this year. Pakistan doesn't have a CAD because its economy is in a coma. For eg if PAkistan seriously thinks of addressing its power shortfall it must import coal fired plants worth atleast 20-30 billion from China. But its economy is so paralyzed that the economy is on a per capita basis contracting for the past 3 years and looks set to continue to do so this year. India on the other hand doesn't really need to worry exports growth>>Import growth for past 4 months so CAD should stablize somewhere this year at below 3% GDP. FIRST, the good news. The reforms package mooted by the PML-N and to be `implemented` by a bipartisan committee has some good stuff in it. Now to the bad news: even if implemented fully, something only the chronically delusional could hope for, the reforms package doesn`t even begin to address the immediate, and far more dangerous, economic threat. Essentially, the government is in desperate need of money. Lots and lots and lots of money; perhaps as much as a trillion rupees in the year ahead. Scan through what`s been mooted by the PML-N and the measures the bipartisan PPP-PML-N committee is supposed to debate, though, and there`s nothing meaningful about revenue generation. Which means the government is still left with a VERY, VERY BIG PROBLEM: where will it find a trillion rupees? Good ol` Zardari asked Obama for a bail-out, hoping to cash in on the ultimate moral hazard with Uncle Sam. Except it didn`t quite work: get real, Zardari was told, we`ll help you guys out when you guys get serious about reforms. So, tail between its legs, the government will end up pounding on the doors of Shahid Kardar. Print us some more money, it will demand of the State Bank, or else we`ll find someone who will. But here`s the problem. In December 2009, a certain esoteric piece of data read Rs1.35 trillion. That, for simplicity`s sake, was pretty much the currency in circulation in the economy. In December 2010, this figure had gone up to Rs1.6tr. Rumour has it that the State Bank may be pumping as much as Rs2bn a day into the economy at present. Quick back-of-the-envelope calculations reveal the full horror of what is in store for Pakistan. Between the end of 2009 and the end of this year, the currency in circulation may well double. But the size of the economy won`t have grown by more than a smidgen. Twice the money, the same amount of goods and services — figuring out the impact on prices isn`t very difficult. Plan A is a bailout from the Americans or the IFIs. If Plan A doesn`t work, there`s Plan B: shell out patronage. Not enough cash to feed the mouths at home? No problem, Benazir Income Support Programme to the rescue. A couple thousand bucks every other month, and don`t forget to vote for the party of Shaheed Mohtarma. Village needs a road? Here`s a few million for a shoddily built one, enough to drive wagons full of voters to the nearest polling booth come the next election. Gas connection? Local school? Irrigation project? Cheque, cheque and cheque. Actually, to figure out the PPP`s road map to the next election, look no further than the Musharraf strategy in 2007-08. Subsidies ballooned as the prices of electricity, petrol and other commodities were frozen. `Project money` was thrown around willy-nilly, political expediency trumping economic sense. But wait, wouldn`t throwing around even more money only compound the problem when too much spending and too little earning was the problem in the first place? The future is another country. Right now, there are votes to be won. A worldwide survey was conducted by the! UN. And in the USA they didn't know what 'the rest of the world' meant! NEW DELHI: Buoyed by steady recovery in demand for technology services, the Indian IT-BPO sector is estimated to have grown 19% in 2010-11 to $76 billion in revenues, software industry lobby Nasscom said on Wednesday. “Pent-up demand for IT-BPO services and return of discretionary spending in the market were the key drivers for the industry performance,” Nasscom president Som Mittal told reporters. Exports continued to be the mainstay of the industry with revenues of $59 billion, growing at 18.7%. Domestic market, on the other hand, grew 16%, to aggregate rs 78,700 crore (about $17 billion). For FY12, the software and services growth is expected to grow at 16-18% with $68-70 billion in revenues. The domestic market is estimated to grow by 15-17% with revenues of Rs 90,000-92,000 crore (about $19-20 billion). Riaz, what about the private sector? "Wipro Chairman Premji, who along with a number of eminent personalities had recently written an open letter on a "governance deficit", said they would focus on the "complete breakdown in public governance across the board". "I am extremely disappointed. I think it is a national calamity and is personally very devastating because one had so much confidence when they (UPA-II) came in," he told television channels when asked whether the present government was "unable to deliver". "We think it is important. We focus attention on the complete breakdown in public governance across the board, whether it is government, or businessmen, or traders...," he said. "One has reached a point in public governance where one has to take stock... Enough is enough, we have to reform ourselves. If we don't do that, we are not going to leave children behind us proud of the country, despite 8-9 per cent (economic) growth." Mayraj: "Wipro Chairman Premji, who along with a number of eminent personalities had recently written an open letter on a "governance deficit", said they would focus on the "complete breakdown in public governance across the board". Azim Premji stands alone in the midst of corrupt and rapacious Indian business and government leaders. Unlike Ambanis and Tatas, Premji has already given a billion dollars for philanthropy, and he has criticized Indian government on rampant corruption and increasing governance deficit. But he is a lone voice drowned out by the loud noise of the "India Shining" crowd. Thank you for highlighting the corruption in India. The article by The Conservative BJP leaning Indian Express author is more aimed at the current Congress government. I doubt however that it is your intention to rectify the current level of corruptio that exists. I think a throttling back of growth by 1-2% points for 1 year is perfectly acceptable after all even china's growth is now 9% down from 12% and likely to decrease further by 1-2% points this year. Actually the situation is complicated inflation in India is rising so much partly because 70% of the inflation index is food related and food prices have been rising globally thanks to erratic weather in russia and australia thanks to la nina..
and thus higher interest rates may be counter productive. Still given its record one should give RBI the benefit of the doubt. Anon: "Actually the situation is complicated inflation in India is rising so much partly because 70% of the inflation index is food related and food prices have been rising globally "
Yes, it is hard to fight food and fuel inflation...particularly fuel because India has to import it and its price depends on global suply-demand situation. And RBI's monetary policy alone is not enough; it'll take a combination of monetary and fiscal discipline whch is lacking in India due to large and growing budget deficit and curret account deficit. current account deficit /surplus has zero impact on inflation in any country.Neither does budget defecit infact if anything a large budget deficit causes deflation as governments borrow money from financial markets and institutioanl lenders to make up the shortfall thus taking liquidity out of the market. Fundamentally even with food inflation indian food prices are low on an absolute $/tonne relative to the rest of the world on most food items. The problem is due to growth demand for food is increasing far in excess of farm output due to economic growth. This currently cannot be adjusted with imports as external prices of food is much higher than indian prices. So my prediction is food inflation will continue till indian prices are nearly at par with world prices after which it will plateau out and rise/fall with world prices. current account deficit /surplus has zero impact on inflation in any country.Neither does budget defecit infact if anything a large budget deficit causes deflation as governments borrow money from financial markets and institutioanl lenders to make up the shortfall thus taking liquidity out of the market"
All spending, public or private, is stimulative, which stimulates aggregate demand that causes inflation. If the RBI jacks up interest rates to cool private borrowing and spending, and the governmemt continues its spending spree, the two will cancel each other, the economy will not slow, nor will inflation come down. There are many causes for inflation, depending on a number of factors. For example, inflation can happen when governments print an excess of money to deal with a crisis. As a result, prices end up rising at an extremely high speed to keep up with the currency surplus. This is called the demand-pull, in which prices are forced upwards because of a high demand. Another common cause of inflation is a rise in production costs, which leads to an increase in the price of the final product. For example, if raw materials increase in price, this leads to the cost of production increasing, which in turn leads to the company increasing prices to maintain steady profits. Increased government spending and the resulting higher deficit DOES NOT directly cause inflation unless additional liquidity is injected into the economy by printing money. Too much money chasing fewer goods and services. If the government simply BORROWS money or raises money via BONDS it will not cause inflation - but it may impact future growth! It is very similar to sponsoring an trade show event in Las Vegas. The confederation of Indian Industry decided to sponsor the entire event promoting many aspects of the Indian private sector in 2006. Once you get the necessary exposure, the various industries count on the multiplier effect which my company got before we sold it to Wipro. The event was sponsored by the private industry and not the government. not really fuel prices in india are administered and something like 50% of retail prices are due to taxes. Anon: "not really fuel prices in india are administered and something like 50% of retail prices are due to taxes." Reducing or removing fuel taxes will make India's budget deficit (already at 5% of GDP) a lot worse, forcing the govt to borrow even more than its is already. If feedstock is at $100 and u cut tax to 10% u still get $10. The sensitivity of retail petrol to crude price is not 1:1. After reading some of your previous "musings" I have made some conclusions. In general you tend to have a bias against India which prevents you from an accurate analysis. The topics you choose are contrived to appease Pakistanis who are ready or waiting for any "ills" of India they can get their hands on. You accuse a number of magazines of bias reporting but, yet you continue to do the same. Your investment ideas are often misleading (KSE article) to people you are trying to appease (Sohail, eg). I understand that you may be trying to "help" Pakistanis by making them feel better by highlighting the ills (and there are many) of India. However, you often propagandize such information at the expense of misleading them. India has myriad of problems no doubt and any attempt to solve them begins by thoroughly understanding them. The same goes for Pakistan. Bhimsen: "In general you tend to have a bias against India which prevents you from an accurate analysis"
The fact is that your reading is selective, and you are easily offended when I criticize India based on published data and sources that I cite, but you readily accept all of my frequent criticisms of Pakistani leadership for their corruption, incompetence, poor governance, etc. And I bet you also think that all of the analysis and reports of the organizations such as UNICEF, UNDP, WHO, IFPRI, OPHI, British intermational aid dept, India's Planning Commission,etc. also have a bias against India for finding that Indians are poorer, hungrier and sicker than Pakistanis and even some of the sub-Saharan African nations. Bhimsen: "Your investment ideas are often misleading (KSE article) to people you are trying to appease (Sohail, eg)." I do not offer any investment ideas or advice to anyone; I simply offer publicly-availabl data that shows that the KSE has outperformed BSE over the last one year, five years and ten years. There is no need or reason for me to appease anyone. Riaz basically what you are saying if every single dollar of hot money is repatriated today India will still have around $120 billion out of its $300 billion FX pile to finance its CAD at current rates for 3 years assuming not one additional cent comes in way of FII/FDI for the next 3 years. Anon: "India will still have around $120 billion out of its $300 billion FX pile to finance its CAD at current rates for 3 years assuming not one additional cent comes in way of FII/FDI for the next 3 years." You are assuming that nothing else is affected by it. But that's not how economies work. First, $120 billion is only enough for just four months of imports for India, an alarming indicator for any nation's balance of payments situation, and its ability to produce goods and services for domestic consumption and exports. Second, , it'll significantly cut India's economic growth rates which result from significant FII and FDI. Third, sudden withdrawal of hot money will cause a major Indian stock market crash that can easily destroy overal economic confidence and bring down the rest of the Indian economy dramatically...similar to what happened in the late 1920s depression in America. A sudden withdrawl of all FII from any economy on the planet will wreck it. The point is sudden withdrawls of large amounts usually happen in economies with tiny FX reserves and artificially manipulated exchange rates as the arbitrage opportunities is kind of obvious. In India on the other hand the RBI doesn't artificially peg the currency to any other aka Yuan to USD.So the rupee is more or less trading at fair value. Anon: "Since FII s look out for attractive places with high growth they will keep coming to India"
If India is so attractive, why are Indians net sellers? Domestic institutions were net sellers of equities for Rs 19,503 crore in calendar 2010, according to the Hindu Business. And why has Sensex been range-bound. The benchmark has been trading between 17,000 points and 21,000 points right through 2010? if you attempting to challenge the indian growth story...the arguments put forth are credible and have the backing of a large section of economists, the world over. BUT, certainly not if you wanna play out a tale about how/if Pakistan is faring better. KSE vs BSE...really?! the KSe has a ridiculously puny market cap of 35 billion USD. Reliance Industries alone has a market cap that is 3-4 times the cap of the whole of KSE. BSE's market cap is 1.6 TRILLION USD. How do you even compare the two? As for range bound movement in the BSE...number of factors are responsible...but i'll have you know that indian equities trade at a premium to most other markets...and there's a strong reason for that - GROWTH ENGINE. Indian estimate for GDP growth in FY 10-11 is 8.6%. Correct me if i'm wrong, but pakistan has managed a "stellar" performance of about 2-3 percent (http://www.dailytimes.com.pk/default.asp?page=2011%5C02%5C03%5Cstory_3-2-2011_pg5_1). As for FDI, again the quantum Mr. Haq, makes a difference. If i'm not wrong, despite FDI decreasing India attracted 18 times more FDi than Pakistan in 1st half of FY11. And as for the link you had posted about FDI as a percent of GDP - the same chart shows FDI as percent of fixed investment. You had chosen 2007 as the year to project the gap b/w pak and ind in terms of FDI as percent of GDP. well the same year stats show that pak needed FDI for 12.7% of gross fixed investment as opposed to india's 5.2%. So...really, who needs it more? (as for your arguments about the deficit...india's middle class and expected govt spending on infra is expected to attract a lot of attention...so we appreciate your concerns, but we couldn't care less about your pessimistic views...this even as Blackstone Group appears to be confindet of the indian growth story and about the inflow of funds in the indian secondary markets). On yeah...inflation was another concern that you pointed out. pakistain inflation in the last three calendar years has been swinging wildly betweeen 25% (oct 2008) and 8.9% (oct 2009), managing to stay in double digits throughout 2010 (http://www.tradingeconomics.com/Economics/Inflation-CPI.aspx?Symbol=PKR). And while the RBI action are showing some results in India (inflation has stayed within single digits since aug 2010) pakistan's inflation is picking up upward momentum since the same point - aug 2010. Pakistan's economy can definetly do better with more of your wisdom. I'll stick to slightly more credible names such as Blackstone Group . Hows that?? 140th. That's almost double that of india. Twice more corrupt?? Pakistan is a joke when compared to india. The only area it looks respectable is - defence might. But even that is subject to a debate about which of the two countries has stronger conventional capabilities. And spare me the details about pak having more nukes. Indian will need only a handful of bombs to dismantle pakistan and vice versa. Having said that - India doesn't belong in the same league as China. That impressive country has muscle like no other - in all spheres. But, really, despite jingoistic compulsions please steer clear of an indo-pak comparisons - sounds ridiculous. It hurts, but pakistan is far from being any match to india - just the way china is head and shoulders above india. Ashmit: "KSE vs BSE...really?! the KSe has a ridiculously puny market cap of 35 billion USD. Reliance Industries alone has a market cap that is 3-4 times the cap of the whole of KSE. BSE's market cap is 1.6 TRILLION USD. How do you even compare the two? " Stock markets and companies' shares are investment vehicles and they should be compared based on current valuations and performance, not just size. It is these criteria that are used by international and domestic investors, not current market cap per se. The market cap is only relevant when a market like BSE gets so ridiculously overvalued by an avalanche of hot money that it exceeds the India's GDP, and KSE remains cheap and and attractive because it is trading at about 50% of the PE at BSE, and KSE market cap is only a fraction of Pakistan's GDP, a healthy sign that shows potential. Ashmit: "And as for the link you had posted about FDI as a percent of GDP - the same chart shows FDI as percent of fixed investment. You had chosen 2007 as the year to project the gap b/w pak and ind in terms of FDI as percent of GDP. well the same year stats show that pak needed FDI for 12.7% of gross fixed investment as opposed to india's 5.2%. So...really, who needs it more?" This is nonsense. India needs FDI more than Pakistan because of its massive current account deficits. And India's FDI's drop of 30% last year is hurting it. Your Last statement that drop in FDI is hurting India is Completely baseless . India's valuations are due to the high ROCE of Indian corporations.Incidentally since Pakistan economically is not doing anywhere close to half as well as India I think the KSE is hopelessly overvalued and being pumped up by hot money. Anon: "Your Last statement that drop in FDI is hurting India is Completely baseless .How Exactly is it hurting Please clarify"
It's forcing India to take huge risks by relying on hot money to fund its large and growing current account deficit. India's FDI has declined by a third from $34.6 billion in 2009 to $23.7 billion in 2010. Its current account deficit is being increasingly funded by short-term capital inflows (FII up 66% from $17.4 billion in 2009 to $29 billion in 2010) rather than more durable foreign direct investment (FDI), posing a risk to external balance and funding of gap, according to a recent warning by Goldman Sachs. "Nearly 80 per cent of the capital inflows are non- FDI related. Given the excess spare capacity globally, FDI may remain weak going forward," the Goldman note said. Anon: "India's valuations are due to the high ROCE of Indian corporations.Incidentally since Pakistan economically is not doing anywhere close to half as well as India I think the KSE is hopelessly overvalued and being pumped up by hot money." Is that why Indians are net sellers of Indian equities? The fact is that the 66% spike last year of hot money into India unleashed by the US Fed is building a bubble in Bombay that can burst any moment....Chinese are smart and they have already imposed severe limits on hot money inflows there. Joseph Stiglitz, a Nobel Laureate Columbia University economist, has argued that India is more vulnerable to an asset bubble than China, saying that “strong economies that don’t yet have capital control become the focal point” for the liquidity injected by the US Federal Reserve. Stiglitz thinks that India, more than China or Brazil, should watch out for the tidal wave of money made available from the Fed’s quantitative easing. firstly, the vigour and fervour with which you incessantly sell the same arguments, is commendable. Secondly, for someone who appears to be reasonably well informed of contemporary issues, the way you choose to NOT take cognisanze of the pakistan's pitiable position - fiscally, too, is perplexing. At the risk of sounding redundant, I have already conceded to your arguments about the nervous situation that India has landed herself in. But, i don't susbscribe to the idea that pakistan fares any better. My contention is simply that India is not great, but Pakistan is far worse. Now speaking of deficits. How does it feel, as a pakistan supporter, to have matters of cabinet being orchastrated by international agencies? Pakistan's federal ministers have been made to resign, after pressure from the IMF. IMF threatens to choke the credit flow and Pakistan's representatives are seen jumping through hoops. Reason - fiscal DEFICIT, expected to climb baloon to 8 percent. With tax earnings marginally up by roughly 6% and and non-tax revenues slipping by a huge 35%, the situation looks grim for pakistan. meanwhile, to quote a online newspaper report (thenews.com/pk) - " The public debt has crossed the red mark of more than 60 percent of the Gross Domestic Product (GDP) or 10 trillion rupees. Hard times and a grim future! A large budget deficit is considered the mother of economic problems. It multiplies public debt, increases interest rates and reduces fiscal space. That’s what has been happening in Pakistan where social sector and development spending have taken a deep cut." As your govt borrows more, credit becomes more expensive impairing the already slow growth, pushing up inflation to new highs. Leading economists and even the SBP think so (http://www.thenews.com.pk/TodaysPrintDetail.aspx?ID=29597&Cat=3&dt=2/6/2011). And i have come across your jeers about India's CAD while citing a surplus for pakistan (which really doesn't even qualify as pocket change). Well the SBP, itself, doesn't seem to share your sense of optimism. With imports likely to pick up momentum, whatever advantage that the country gained will be dented severely (http://www.thenews.com.pk/TodaysPrintDetail.aspx?ID=29064&Cat=3&dt=2/3/2011). And what about the brent crude going past the 100 dollar mark. Does Pakistan have the wherewithal to weather the storm? The numbers don't think so. Moreover, debt ratings looks miserable. S&P rates pakistan's sovereign credit as B-, and a short term sovereign credit rating of C. Both significantly lower than the "investment grade". The picture looks dismal. Its not UTOPIA, here either, but India fares better. So, yes. I'll concede that grave economic threats confront india, if you concede that pakistan has a lot more to worry about. And finally, Egypt, Tunisia, have been making headlines for uprisings due to various reasons - but at the risk of sounding simplistic, one of the strong causes being the prevailing situation of economic distress. I came across this interesting read (cant find the link right now). That article showcased how all of those nations, had infact, a track record far superior to that of pakistan. So...is pakistan heading the egypt way? Just some food for thought. Not drawing any analogies. Anonymous: "http://online.wsj.com/article about car sales"
The January 2011 double digit increase in car sales in India is a clear sign of an over-heating economy due to unrestrained credit expansion that is fueling double-digit inflation. Ashmit: "My contention is simply that India is not great, but Pakistan is far worse. " Judging from the perspective of a few Indian billionaires and their urban middle class supporters, India is doing quite well. However, from the point of view of the poor South Asians, Pakistan is well ahead of India in meeting the basic needs of the poor. There are some arrogant Indians in cyberspace as well as the physical world who contemptuously dismiss any comparison of India and Pakistan. However, the responsible Indian and UNICEF officials concur that Indians are much worse off than Pakistanis and Bangladeshis in terms of basic nutrition and sanitation. India is worse than Bangladesh and Pakistan when it comes to nourishment and is showing little improvement in the area despite big money being spent on it, said India's Planning Commission member Syeda Hameed. "There has been an enormous infusion of funds. But the National Family Health Survey gives a different story on malnourishment in the country. We don't know, something is just not clicking," Hameed said. "I should not compare. But countries like Bangladesh, Pakistan and Sri Lanka are better," she said. The conference was organized in 2008 by the Confederation of Indian Industry and the Ministry of Development of Northeastern Region. According to India's National Family Health Survey, almost 46 percent of children under the age of three are undernourished - an improvement of just one percent in the since 2001. India might be considered an emerging economic power, but it is way behind Pakistan, Bangladesh and even Afghanistan in providing basic sanitation facilities, a key reason behind the death of 2.1 million children under five in the country. Lizette Burgers, chief water and environment sanitation of the UNICEF, has said India is making progress in providing sanitation but it lags behind most of the other countries in South Asia. While a mere 14 percent of people in rural areas of India - that account for 65 percent of its 1.1 billion population - had access to toilets in 1990, the number had gone up to 28 percent in 2006. In comparison, 33 percent rural Pakistanis had access to toilets in 1990 and it went up to an impressive 58 percent in 2006. Similarly in Bangladesh, 36 percent of rural people have access to proper sanitation. The corresponding figures for Afghanistan and Sri Lanka were 30 percent and 86 percent respectively. So I'd encourage you to think about the 75% of Indians surviving on less than $2 a day (vs 60% of Pakistanis) and the families of the 7000 Indians who starve to death every day, and the survivors of the 200,000 farmers who have killed themselves over the last ten years. Ashmit: "So...is pakistan heading the egypt way? Just some food for thought. Not drawing any analogies." Pakistanis have already gone through the struggle that Tunisians and Egyptians are going through now. It's unfortunate that even the elected leaders in developing nations, such as India and Pakistan, are corrupt and incompetent and serving their people badly. Malnutrition cannot be the only parameter to measure quality of life. The most reliable statistic for comparison is the Human Development Index that gives a score of 0.585 for India and 0.527 for Pakistan. Also as far as corruption goes, the top coterie of decision makers in India is far far cleaner today than at any time in the past. And far more capable as well. Men like Dr. Singh, P. Mukherjee and P. Chidambaram belong to an outstanding calibre with unquestionable personal credentials. A few ministers from regional parties like the DMK and NCP that the Congress relies on for power have been irritants but thanks to overwhelming media exposure, even that is set to become a thing of the past. Also another very positive trend in the states, is that honest and efficient leaders like Nitish Yadav in Bihar, Modi in Gujarat(as much as I dislike the fellow), Shiela Dikshit in Delhi etc have been repeated been re-elected, proving that good governance pays off. Overall if one were to look at the bigger picture instead of individual corruption cases, it would certainly make the unbiased observer feel optimistic. With the most powerful men in Pakistan being Asif Zardari and Nawaz Sharif, I don't think you're being fair in drawing parallels here. Tunisia, Egypt, Bahrain... Sonia & Rahul Gandhi's Corrupt Indian Family next ? Despite your almost intimidating profile, the uneducated opinions that you like to proliferate, attempting to scavange for some lost pride for an equally lost nation - are disturbing. I did run your views by some practiciing and successful economists, CAs, CFPs, brokers and analysts. They back my views about why it continues to remain ridiculous comparing the petty Karachi stock exchange to the behemoth that the BSE is. But i'll save those arguments for another day. For now, lets look at the data that you have presented. KSE is flattish while the BSE has witnessed a steep correction. Conceded. But, for a ridiculous moment, even if i were to comapre the two indices, one unmistakable factor that you have twisted to suit your morphed views is - TIME. Yes, to view the performance of the indices over the previous few months, Karachi has acttually fared better. But to lend any credibility to insipid ideas such as KSE "outperforming" BSE (?!?!?!?!) you have to take into account performance over the last few years and not months or days. In the last three years (from 14-march-2008 to 04-march-2011), the KSE story looks pathetic. And the 2008-09 crash, when the whole index was painted red, doesn't quite say much about KSE as "investment destination". On march 14th of 2008, the KSE closed at 15,087. And over the next three years, with the KSE treading the troubled waters, that is the the pakistani corporate and political landscape, the index barely held its own and slipped to 12,045 by 4th of march 2011 (http://www.bloomberg.com/apps/quote?ticker=KSE100:IND) - a fall of over 20% over the 3 years period . The BSE meanwhile, rallied hard. Blazing ahead, nearly hitting the all time high in the november of 2010. Within exactly the same period, the BSE surged from 15,760 to 18,174 (http://www.bloomberg.com/apps/quote?ticker=SENSEX:IND)- a jump of over 15% (this includes the relatively short burst during which the KSE actually fared better). Clearly the BSE, despite all the valuation fears, performed beter for FIIs and DIIs - making us richer!! From a slightly longer perspective of 5 years, (unfortunately for the hurt pride of some jingoistic pakistanis) the picture doesn't change much in the KSE vs BSE story. On 16th of march of 2006, the KSE closed at 10,689 (http://www.bloomberg.com/apps/quote?ticker=KSE100:IND). Keeping in mind the reference point of 4th march 2011 (KSE - 12,045), despite your efforts to hardsell the undervalued staus of KSE, investors don't quite have the same level of confidence with a snails pace of merely 12.68 percent beinf recorded, OVER 5 YEARS. In exactly the same period, the BSE, drawing from strong growth in economy, surged by 67.34% - from 10,860 to 18,174 (http://www.bloomberg.com/apps/quote?ticker=SENSEX:IND). And, lets be a little mature about this and not read into blips and spurts as broadbased trends. Besides, all the concerns that were cited in the article that you quoted are shared by pakistan as well. For instance, India imports 70% of its oil needs - BUT, pakistan imports 80% of its oil requirements (http://www.worldpress.org/specials/pp/pak.htm). Spiralling oil prices are a bigger concern for the pakistani economy. I have given a reality check on paksitani inflation figures, deficits, subsidies, etc (in one of my earlier comments). So please refrain from abusing contributions by other members of the cyber space by using their findings to support convulted ideas such as the BSE being overpowered by its puny neighbour. The contention is again quite simple. India, in most cases, is simply bigger and better than its neighbours. Ashmit: "I did run your views by some practiciing and successful economists, CAs, CFPs, brokers and analysts. ..."
Your experts are wrong. The investors look at multiple criteria that include current market cap, equity valuations and performance over 5, 10 and 15 year periods. KSE-100 index has outperformed not just BSE but all BRIC exchanges and its price-earning multiples are about half of those in Mumbai, Shanghai, etc. If you had invested $100 in KSE-100 stocks on Dec. 31, 1999, you'd have over $1000 today, while $100 invested in Mumbai's Sensex stocks would be worth about $400. Investment of $100 in emerging-market stocks in general on Dec. 31, 1999 would get you about $300 today, while $100 invested in the S&P500 would be essentially flat at $100 at the end of 2010. 5. Pakistanis are a young, resilient nation. The people of Pakistan have defied the dire forecasts made after Swat violence in 2009, and massive summer floods of 2010. ...some recent disquieting developments have rattled air passengers and raised serious doubts about the quality of the people who are flying what most believe are reasonably well-maintained machines. Federal aviation authorities say they will be checking the licences of some 4,000 pilots flying commercial aircraft after allegations that at least four were found to have fake documents. Two have been arrested for using fake certificates to obtain licences. The first, a pilot from the perpetually ailing, state-owned Air India, apparently fabricated his qualifications. The other, who was arrested last week after damaging the aircraft during landing, was found to have used fake documents to get her licence. The licences of the other two pilots are apparently riddled with irregularities, and both have reportedly disappeared. According to one report by news channel CNN-IBN, a pilot who was caught cheating during a flying test in the US in 2000 and denied a licence, got a commercial licence on his return to India by forging his qualifications and has since been working as a senior pilot with Air India. Air India spokesman Kamaljeet Rattan would not discuss that particular case with the BBC. But he tells me the airline is scrutinising the papers of a dozen pilots. "It's nothing very serious, and not at all scary," he says. "These are routine checks." Senior aviation officials echo the views of Mr Rattan. "Fake licences are very few so there is no need to panic," says Bharat Bhushan, India's most senior civial aviation official. But there are suspicions that pilots cannot be faking their papers without some inside help. And aviation analysts believe this is the time to crack down. "This is a very serious issue," Kapil Kaul of Centre for Asia Pacific Aviation tells me. "When pilots are faking their certificates it is a criminal offence. It points to a systemic failure. Airline operators also cannot absolve themselves of responsibility. They need to have more vigorous checks. And decisive action needs to be taken against the pilots." As if all this was not enough, last week the government announced that 57 pilots reporting for duty had tested over the limit for alcohol in the past two years. All were prevented from joining their aircraft. The issue was raised in parliament - according to a parliamentary document I have seen, the pilots were employed by every leading private airline as well as Air India. Ten were sacked; others had their licences suspended or were taken off the flight roster. The airlines have been keeping a low profile on this - like Mr Rattan want to play down the severity of the problems. By and large Indians appear to have been reassured by the government announcement. There's been no public outcry. But concerns about the quality of some pilots have been around for a while. Last August former civil aviation minister Praful Patel was asked in parliament whether commercial pilots had been drunk on duty. He replied there had been no such incident. Another MP actually asked Mr Patel this year whether "under-trained pilots are flying commercial flights... risking the lives of hundreds of passengers". Again the minister denied any such possibility. We met via Lok Satta. He says in email message he has published series of articles in monthly issue of Economic Times. ..doing a series of articles on economic issues in the monthly supplement of Economic Times (IMB) and have been given a monthly series on the same. Part 3: In 1969, President Richard Nixon, in one bold stroke, withdrew all notes above $100. Life became tough for the Mafia and the corrupt. That was the turning point in the black economy of the USA. Coupled with the rise of plastic money in terms of credit cards and debit cards and extensive use of the banking system, black money started reducing from the USA economy.Press on http://mayankgandhi05.blogspot.com/2011/03/economic-times-part-3-currency.html for more. Nearly 400 people have been admitted to hospitals in north India after eating adulterated flour, police say. All the patients had consumed snacks made from buckwheat flour. A mill in the northern state of Rajasthan has been traced as the source, police said. The patients complained of vomiting, diarrhoea and stomach ache. Cases of food poisoning have been reported from the capital, Delhi, and towns of Meerut, Ghaziabad and Bulandshar in Uttar Pradesh state. At least 115 people had been taken to various hospitals in east and north-east Delhi, police said. They said they have detained a number of people for questioning. Buckwheat flour is widely consumed in northern India during Navratri celebrations [festival of nine nights] when a large number of devout Hindus shun grains like wheat and rice. After precipitous drop in FDI, FII inflow into India is also petering out.